The "Agriculture and Forestry" journal publishes original scientific papers, review papers, short communications on agriculture, veterinary medicine, forestry, biology and other natural sciences. 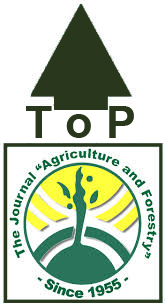 It is the endeavour of the Journal to give place to papers of high scientific quality and international interest, authored by all the scientists from the South East Europe region, as well as other international scientist in order to stimulate contacts and exchange of knowledge fostering scientific productivity. Manuscripts sent to the editorial board (e-mail address: agricultforest@ac.me) should be prepared in Microsoft Word (Times New Roman font, 11 pt) and submitted in format 17 x 24 cm (File / Page setup / Paper / Width = 17 cm; Height = 24 cm), with single line spacing (Format / Paragraph / Line spacing = Single), 2 cm margins all around (File / Page setup / Margins / Top = 2 cm; Bottom = 2 cm; Left = 2 cm; Right = 2 cm), that is approximately 44 lines per page in this format. Manuscripts are published in English. Papers that have been published elsewhere, in whole or extracts (excerpts) of their important findings, will not be accepted. A manuscript should not exceed 10 pages. Exceptions can be made if the content and quality of the paper justify it (at the discretion of the Editor). The author's name should be placed above the title and with the author's appellation and affiliation in a footnote at the bottom of the front page. Author(s) affiliation should indicated name and address of institution, including the e-mail address of the corresponding author. Title should provide a concise but also an informative synthesis of the study (recommended not more than 100 characters including spaces). The Abstract, in English language, should provide basic data on the problem that was treated and the results obtained. It should be brief, preferably one paragraph only, up to 250 words, but sufficient to inform the reader of the character of the work, its results and its conclusions. Keywords should provide 5-6 words or compound words, suitable for an information retrieval system. The introduction should answer the questions what was studied, why was it an important question, what was known about it before and how the study will advance our knowledge. Material and methods explain how the study was carried: the organism(s) studied; description of the study site, including the significant physical and biological features, and the precise location (latitude and longitude, map, etc); the experimental or sampling design; the protocol for collecting data; how the data were analyzed. In this section also should be provided a clear description of instruments and equipment, machines, devices, chemicals, diagnostic kits, plants/animals studied, technology of growing/housing, sampling sites, software used etc. Results and Discussion may be combined into a single section (if appropriate) or it can be a separate section. The results objectively present key results, without interpretation, in an orderly and logical sequence using both text and illustrative materials (tables and figures). The discussion interpret results in light of what was already known about the subject of the investigation, and explain new understanding of the problem after taking results into consideration. The International System of Units (SI) should be used. The conclusion should present a clear and concise review of experiments and results obtained, with possible reference to the enclosures. If received significant help in designing, or carrying out the work, or received materials from someone who did a favour by supplying them, their assistance must be acknowledged. Acknowledgments are always brief and never flowery. References should cover all papers cited in the text. The in-text citation format should be as follows: for one author (Mirecki, 2011), for two authors (Erjavec and Volk 2011) and for more than two authors (Rednak et al. 2007). Use commas to separate multiple citations. Multiple citations should be ordered chronologically. In the case of publications in any language other than English, the original title should be retained. The titles of publications in non-Latin alphabets should be translated and annotation given, e.g. "(in Russian with English abstract)". More details in the Annex to the INSTRUCTIONS TO AUTHORS / Bibliographic style. The literature section gives an alphabetical listing (by first author's last name) of the references. - Tables and Figures with captions. THE REVIEW PROCESS: Submitted manuscripts are reviewed anonymously by 2-3 international referees (duble blind reviews). All tracking of manuscripts and reviewers is done by the Editor. All attempts will be made to ensure submissions will be reviewed within three months after e-mail submission to the Editor. Manuscripts will be returned to the lead authors when each review is completed. More details provided in the Annex to the Instructions to authors. Ensure that the default language for your document is set to English (UK), by selecting Language from the Tools menu, but note that some terminology differs from this standard. Use z and not s in such words as realize, organization, but beware of words such as advertise, analyse, catalyse, hydrolyse, paralyse and supervise. Also note exceptions such as the Organisation for Economic Co-operation and Development (OECD). Aim for consistency, particularly in the use of hyphenation. Avoid sexist language: replace he, mankind, manpower, spokesman, chairman, etc., by they, human beings/humanity, human resources/labour force, spokesperson, chairperson and so on. Avoid split infinitives, e.g. : The countries agreed to implement the directives fully (not ... to fully implement...). Use the word fewer when referring to quantifiable units, e.g. fewer people, fewer animals. Use less when referring to a singular mass, e.g. less space, less interest. Ensure that verbs agree in number with the subject. Particular care is needed with collective nouns, e.g. government is, and with plural nouns, e.g. data are. That is used for defining or restrictive clauses, e.g. : The girl knocked on the door that was open. (There were several doors, but she knocked on the only one that was open.) Which is used for non-defining or non-restrictive clauses, e.g. : The girl knocked on the door, which was open. (The door she knocked on happened to be open). Although which is increasingly used for defining clauses, when it is used for non-defining clauses it should always be preceded by a comma. Leave only one letter space after a full stop at the end of a sentence. This rule applies to all punctuation. When only part of a sentence is enclosed in parentheses, its punctuation is placed outside (as in this example). The tendency in English spelling is not to hyphenate compound nouns or prefixes where the sense is clear, e.g. subeditor, subregion, overuse, database, germplasm, proofreader, etc. Be consistent. Do not hyphenate adverbial clauses such as centrally planned economies or environmentally sound development. Compound adjectives are hyphenated, e.g. long-term planning. Note, however, planning in the long term, where long term is a compound noun. In proper nouns, use upper case for all principal hyphenated words, e.g. European Commission for the Control of Foot-and-Mouth Disease. Do not capitalize, however, where a hyphen is part of a prefixed word. An en rule (dash) is longer than a hyphen and can be used either as a parenthetical dash or to convey a distinction in sense. Press CTRL+MINUS on the numeric keypad to obtain the correct en rule. Do not use double hyphens to denote an en dash. Paired, parenthetical dashes have a space on either side, e.g. Poverty in rural areas – where 94 percent of the poor live – has been reduced at a slower rate. They should not be overused; no more than once per paragraph. Unspaced en rules are used when the first part of a compound does not modify the second part. They can be thought of as meaning and or to. Do not use the en rule in a range of values or dates with the constructions from ... to or between ... and, e.g. from 1970 to 1987, not from 1970–1987. Apostrophes signify the genitive or possessive case and appear after the noun in its usual form. Hence, the singular a reader’ s letter (the letter of one reader) and the plural several readers’ letters (the letters of several readers). Note the distinction between it’s (it is) and its (genitive), e.g. It’ s something important, but its importance is relative. Reported speech is enclosed in double quotation marks. Where there are several consecutive paragraphs of speech, open quotation marks at the beginning of the first and every following paragraph; close the quotation marks only at the end of the final paragraph. When entries are more complex, use initial lower-case letters and end each with a semicolon, except for the final entry, which ends with a full stop. When entries consist of complete sentences, begin each with a capital letter and end each with a full stop. Avoid excessive use of capital letters in text. In headings, subheadings, captions and book titles, use capitals only for the initial letter of the phrase and of proper nouns. The French Government ruled that ... but All participating governments were asked to comment on the ruling. Words such as committee and commission take a capital letter when used as part of a proper name, e.g. the Codex Alimentarius Commission discussed the issue. The words Organization and Secretariat only take a capital letter when referring to the Institution. Similarly, the Conference of FAO, after it has been mentioned in full, may subsequently be referred to as the Conference (with a capital letter). The word state takes a lower-case initial letter when referring generally to the institution or to nations or divisions of a nation; it takes a capital S when a specific state is named, e.g. State of Andhra Pradesh; but state-owned enterprise, head of state. In geographical names, north, south, etc. are capitalized if they are part of the title of an area or a political division, e.g. East Asia, but not if they are descriptions in general terms, e.g. southern Europe. When referring to tabular or graphic elements in a text, use a capital letter for Table, Figure, etc. to indicate genus or species, e.g. Oryza sativa, Cucurbita spp., but not for higher levels of taxonomic classification, e.g. Brassicaceae. Note that modifiers to species’ names (such as cv., var., spp.) and species' authorities are not italicized. Note that most acronyms do not have full stops, e.g. FAO, not F.A.O. Use spaces, not full stops or commas, to denote thousands, millions, etc. (e.g. 10 000, 150 000 000). Note: US$5 000. Use hard (non-breaking) spaces to avoid awkward number divisions at the end of lines (press CTRL+SHIFT+SPACEBAR). Write fractions in words rather than numbers: one-third. Use Système Internationale (SI) units (tonnes, hectares, etc. ), with equivalents in parentheses if necessary. Do not use punctuation or letter spacing in such measurements as cm, mm, g, ha, ºC. Note, however, that there should always be a space between the number and the unit, e.g. 3 cm, 70 g, 37 ºC. Do not abbreviate the words litre and tonne. Use percent (not per cent) in text, e.g. Exports increased by 16 percent in the last quarter. The use of % is acceptable in tables and graphs, e.g. 16% (with no space between the number and the symbol). Relational and operational signs should have a space either side of them, e.g. 3 + 2 = 5. Use the multiplication sign × not lower-case letter x. Symbols used for variables, including Greek characters, should be italicized. Write dates in this order: Monday, 16 October 2000 (with no comma between the month and the year). Do not use apostrophes in decades: e.g. 1990s. Do not abbreviate years, i.e. use 1990 and not ’ 90. A range of dates is normally indicated thus: 2001–2003 or from 2002 to 2003. This implies the whole period from the beginning of 2002 to the end of 2003 inclusive, whereas 2002/03 implies one crop or fiscal year of 12 months starting in 2002 and ending in 2003. Note that, when used in tables, three-year averages may take a hyphen to denote the three-year period and an en rule between the two sets, e.g. 1997-99–2007-09. Centuries should be written out in full: the twenty-first century. The use of the 24-hour system is preferred (e.g. 08.00 hours, 13.30 hours). When it is necessary to use the 12-hour system, use full stops as follows: 8 a.m. and 1.30 p.m. Be consistent. The abbreviation US$ may be further abbreviated to $ if defined in an explanatory note. In this case, there is no space between the abbreviation and the amount, e.g. $45 000. The abbreviation for euro (pl. euros) is €. All references must include: name of author(s), year of publication, title, place of publication and publisher (for books), journal title, volume and pages (for articles). The names of all authors of a work should be given in bibliographies. Where there are more than three authors in the bibliography, abbreviate to et al. in the text (but not in the bibliography). When an author has written more than one work in the same year, use a, b, etc. to differentiate, e.g. 2000a, 2000b. Entries by the same author/s should be listed in ascending chronological order. Use the ampersand(&) between the names of the last two authors in the bibliography but use and in the text. Titles of books, journals and periodicals are italicized (do not use inverted commas). Titles of articles and chapters are not italicized. Personal communications are not cited in a bibliography but appear only in the text, e.g. (J. Wright, personal communication, 2000). Haines, S. & Hunter, C. (2000): Exocortis virus of citrus. Citrus Ind., 49(1): 13–17. McKenzie, J. & Gilbert, J.R. (2000): Editorial guidelines. In J. Wright & L. Cole, eds. Points of style, pp. 123–146. Washington, DC, World Resources Institute. 200 pp. FAO (2000): Harvest operations, by I.M.A. Farmer. FAO Agricultural Services Bulletin No. 362. Rome. MOLSS (1999): China labor statistical yearbook 1998. Ministry of Labor and Social Security. Beijing, China Statistical Press. Brandl, F.E. (1988): Economics of trypanosomiasis control in cattle. Vol. 1. Farming systems and resource economics in the tropics. Kiel, Germany, Wissenschaffsverlag Vauk. 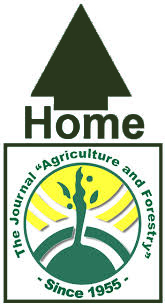 The Journal "Agriculture and Forestry" / Časopis "Poljoprivreda i sumarstvo"
67 days, 19 hours, 41 minutes.